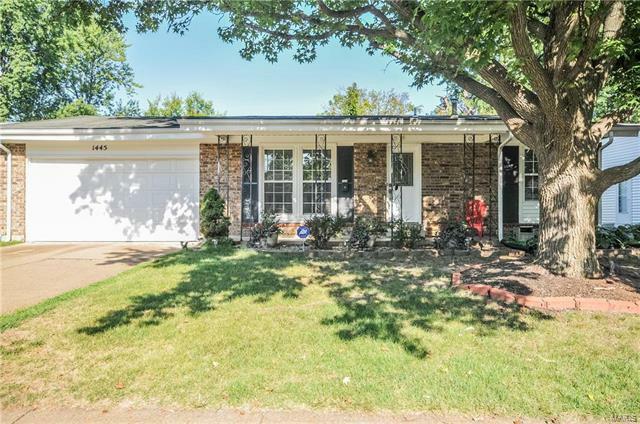 This is a perfect 4 bedroom, 2 bath, 2 car garage ranch style home and move in ready! Plenty of hardwood flooring, freshly painted walls, 6 panel doors, ceramic in the both bathrooms & kitchen plus back splash, gas stove, space saver microwave, newer dishwasher May 17, clean, spacious, ceiling fans, newer tilt in vinyl windows, security system, roof replaced 2001, garage door openers, large unfinished basement, fenced in yard, adorable landscaping and sidewalk leading to aggregate patio. You will enjoy calling this home! 270 North to South on New Florissant Rd, Right on Parker Rd, Left on Bluefield. Home on the left. N Hwy 67/Lindbergh to Florissant Rd to Fox Run to street.